McCalman Garde & Co image from "Victoria and it's Metropolis, 1888"
McCalman Garde & Co (McCG&Co). McCalman, Garde and Co., North Melbourne. This firm commenced operations as agricultural implement manufacturers in 1878, on the site of their present establishment, a block of land in Bedford and Blackwood streets. The business then done was on a limited scale, having only two fires in the shop. The style of the firm at the time was McCallman and Garde, the partners being John McCallman and James B Garde, both first class mechanics in their line of business, who have been taught their trade in the best colonial establishments. This firm continued for about two years with every prospect of a successful future, and at the end of that time the business had so largely increased that it demanded the introduction of additional capital, and to this end a third partner, Mr R Wade, was introduced, who, however, soon afterwards sold out to Mr W White. This gentleman, like his co-partners, is a good tradesman and plough maker, and is thoroughly posted up in the technical part of the trade, in the active duties of which he confines himself to a certain line of work, where this large experience in plough construction renders his services of peculiar value to the firm. He also is colonially taught, having served his apprenticeship and worked in the best Victorian establishments. The style of the firm is now as above. At the start it was decided to make the manufacture of ploughs a speciality, and with that view the necessary appliances were laid down, and the firm has shared in the general increase in the demand for agricultural implements, incident on the taking up, of late years, of vast areas of land for agricultural purposes, having gained a reputation amongst farmers for the high quality of the goods they sent out; so much so, in fact, that they found it necessary to erect more machinery to meet the ever growing trade. 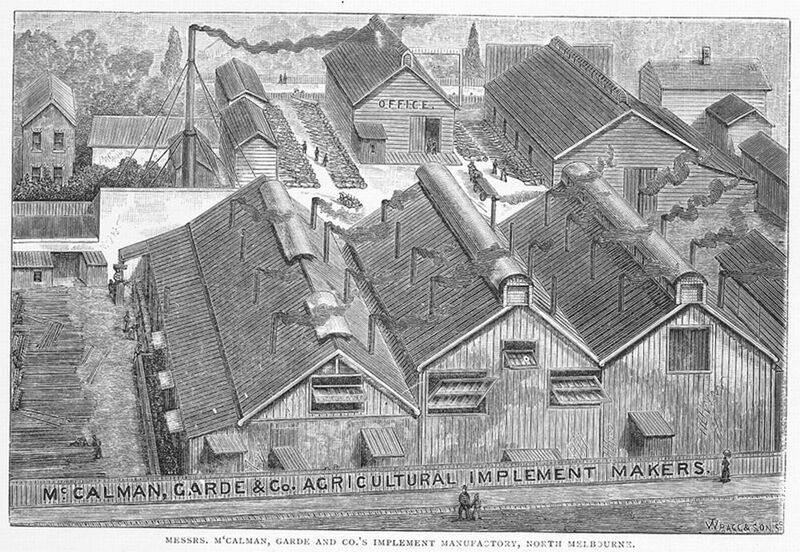 At the melbourne exhibition of 1880-81 Messrs McCallum, Garde and Co. gained a very honorable position, being awarded a gold medal for their exhibit of ploughs, scarifiers, harrows, &c. Their establishment now occupies an area of three-quarters of an acre of ground, the buildings of a smiths shop 120 ft long by 100 ft wide, containing twenty seven fires, besides special furnaces for certain portions of the work. It is fitted with three steam hammers, and other labour-saving appliances of the latest type, the blast being supplied by one of Root’s patent rotary blowers. The latest addition to the works is a building containing a plant for drop forging, with two immensely powerful hammers, of the newest design. The power now used to drive the machinery is obtained from a 20 hp steam engine, and although the plant in the manufactory is complete and well designed for the work in hand. The offices and showroom face Bedford St, the latter being stocked with highly-finished match ploughs, of which a number are always kept on hand. The double-furrow plough is the firm’s chief article of manufacture, of which some thousands have been made, and of which a number have been sent to England and used as patterns by at least two of the most renowned plough-makers of that country. Messrs McCallman, Garde and Co’s trade is not confined to Victoria but extends throughout the other colonies,New South Wales and Tasmania especially being large purchasers of their implements. 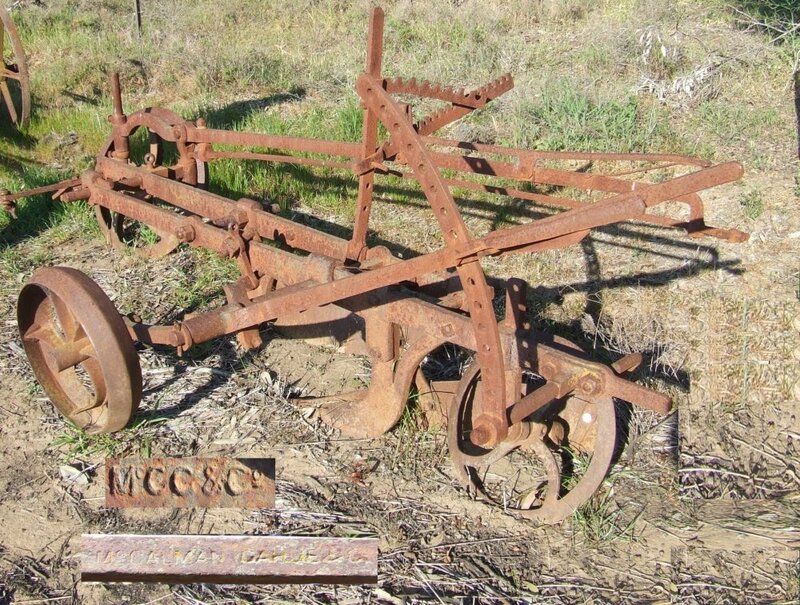 Their ploughs have taken numerous first prizes in various ploughing matches during the last nine or ten years, in close competition, and they may fairly be reckoned among the most successful plough-makers of Australia. By 1916, there was no mention of MCG&Co in the Australasin Manufacturer's Directory - presumably they folded or were taken over before then. The company name became famous as the builder of the first five harvesters for Hugh V Mckay. I have found McCG&Co listed in Melbourne S & M Directories from 1895 to 1897. If there are others in existence, please make contact and share your picture / knowledge . McCG&Co Cast Plow Spanner with Hammer , about 16in long© Ozwrenches. McCG&Co Plough with inset pics of the name and initials as found on the ironwork of the plough © Ozwrenches. 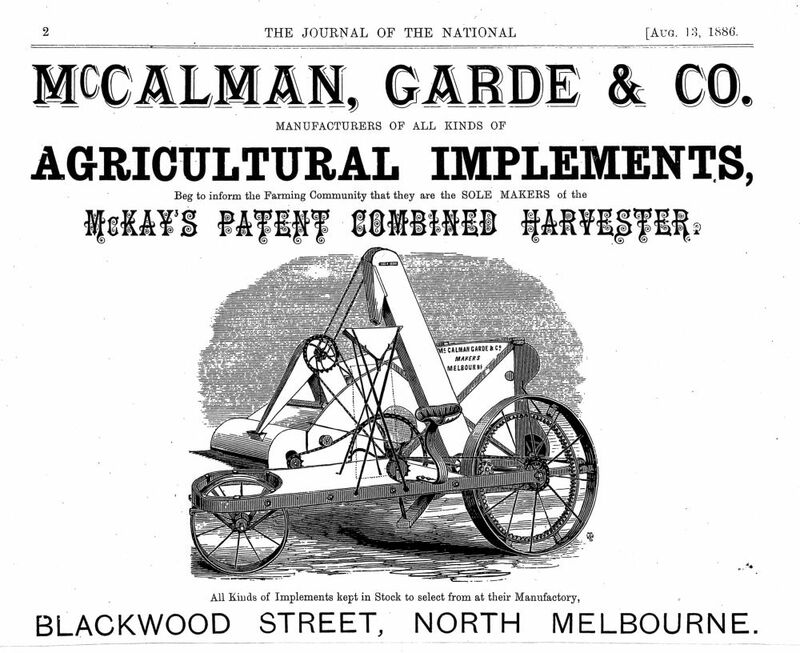 McCG & Co Advertising as "The SOLE MAKERS of the McKAY'S PATENT COMBINRD HARVESTER" image courtesy D Symons, © Ozwrenches.